A synchronized network time is essential for energy efficient scheduling, data fusion, localization and many other wireless sensor networks (WSN) applications. 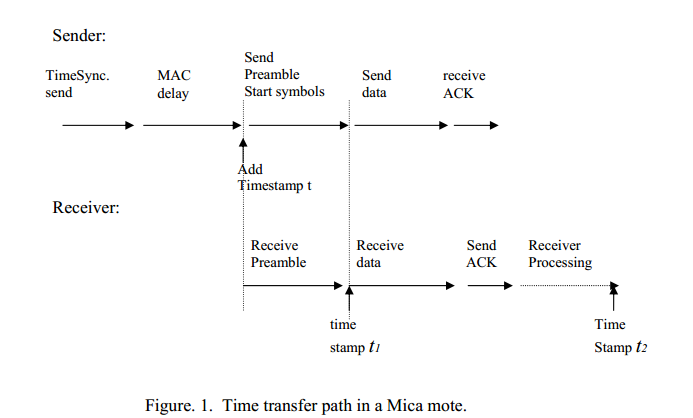 This paper studies the special issue of time synchronization in tiny sensor networking devices and presents a Delay Measurement Time Synchronization (DMTS) technique applicable for both single hop and multi-hop wireless sensor networks. DMTS is flexible and lightweight. For a single hop WSN of n nodes, it takes only one time broadcast to synchronize the network regardless the value of n. As aresult it adds minimum network traffic and is energy efficient, because radio communication is a significant source of energy-consumption in a WSN. For a multi-hop WSN of n nodes, DMTS requires n time message exchanges in total in order to synchronize the whole network. synchronization error is approximately 1.5 clock ticks.